The cross-country trail winds through approximately six kilometres of the picturesque Hornsby Park Bushland Reserve and Old Mans Valley. The one-metre-wide natural surface trail (known as a ‘single track’) has been designed with gentle gradients that are not prone to water erosion and much of it will look like a regular bushwalking trail. Stage 1: A 2.5-kilometre cross country trail behind Hornsby Park and adjacent to Quarry Road. Construction has commenced. Stage 2: A 3-kilometre Old Mans Valley cross-country trail that links with stage 1. Construction of stages 1 and 2 are expected to be complete by the end of November 2012. Stage 3: A small pocket park in Old Mans Valley with a skills circuit, pump track and jump runs has been proposed, though details have not yet been finalised. The single track mountain bike trail will be a combination of narrow handmade bushland trails and flowing one-metre-wide machine-made trails. 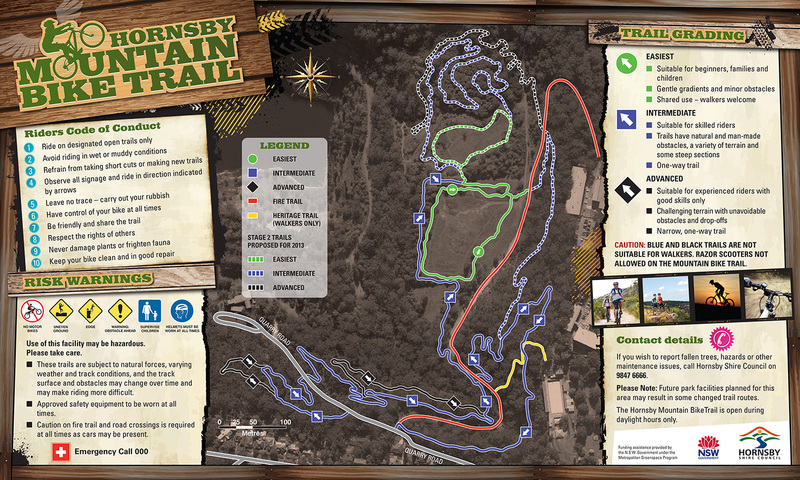 This 'flowtrail' is a popular design which increases riders’ momentum and fun factor. The trail is close to town, which gives riders plenty of convenient places to buy food and bike supplies.